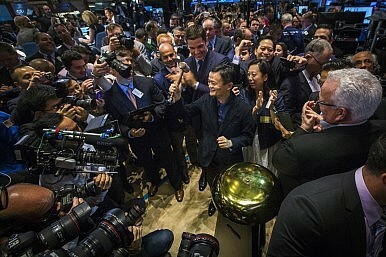 Jack Ma may have become China’s richest man with the float of Alibaba, but he is just one of 560 Asian billionaires in another year of growing wealth at the top. According to the Wealth-X and UBS Billionaire Census 2014, the world’s billionaire population has reached a record high of 2,325, up 7 percent from a year ago. With a staggering combined wealth of $7.3 trillion, up 12 percent from 2013, the ultra-wealthy group would rank third as a country in terms of gross domestic product, behind only the United States and China. While Asia ranked third behind North America and Europe in its billionaire population, the region accounted for 30 percent of the net increase in global billionaire wealth, helped by the rise of Chinese technology tycoons such as Ma and Baidu’s Robin Li. “Asia is the only emerging market to have experienced strong growth both in terms of the number of its billionaires and its billionaire wealth – and this trend looks set to continue. Not only are Asian billionaires the world’s youngest, at 61, they are also particularly entrepreneurial: only 13 percent have fully inherited their wealth,” the report said. For Asia’s billionaires, real estate and industrial conglomerates have been the main wealth generators ahead of banking and finance, leading the region’s wealthy to hold only 16 percent of their net worth in “liquid” assets such as cash. North America remains home to the largest number of ultra-rich with 571 billionaires, up 11 percent from the previous year. Nevertheless, China increased its billionaire population by 21 percent to 190, the biggest such number in Asia, with a combined wealth of US$440 billion, contrasting to its per capita GDP of below $7,000. Sixth-ranked India slipped slightly to 100 billionaires, down from 103 the previous year, with their wealth also dropping, followed by Hong Kong in eighth place with 82 (up seven, with their wealth soaring by 53 percent). Japan, the world’s third-biggest economy, ranked 16th with 33 billionaires, unchanged from the previous year, but their wealth increased by nearly 20 percent. Elsewhere in the Asia-Pacific, Australia slipped two places to 18th with 32 billionaires, as the fading of the resources boom curbed wealth creation. Singapore followed in 19th place with 32 billionaires, ahead of 20th-ranked Taiwan (29 billionaires), while other Asian nations in the top 30 comprised South Korea (23rd), Indonesia (26th) and Thailand (29th). “While the number of China’s billionaires grew twice as fast as that of the United States’, the latter still has three times more billionaires than the former. There is still large potential for catch up growth in China’s economy, but the country’s equities market’s performance this year was disappointing,” the report said. Billionaires remain a rare breed, with just one for every 3 million people on the planet. Yet for billionaire hunters in Asia, Hong Kong has the highest number per capita with 11.2 per million people, ahead of Singapore at 5.8. The richest address on the planet though is the European principality and reported tax haven of Liechtenstein, home to five billionaires among its population of just 37,000. “One of the effects of such a global lifestyle is the decreased relevance of national borders and the increased significance of cities, which can often present specific benefits for an industry or offer higher standards of living,” the report said. Among the region’s billionaire-heavy cities, Hong Kong ranked top ahead of Beijing (37) and Singapore (32), followed by Mumbai with 28 and Tokyo with 26. According to the authors, two-thirds of Asia’s billionaire wealth is concentrated in the top 10 cities, indicating the barriers that exist outside the main hubs. “As markets become increasingly developed, the concentration of billionaire population and wealth in these hubs is likely to decrease,” it said, noting the diversity within Asia’s economies and the growing population of non-Asian billionaires in the region. For those seeking to join this exclusive club, the top five primary industries were finance, banking and investment (19 percent), industrial conglomerates (12 percent), real estate (7 percent), non-profit and social organizations (5 percent) and textiles, apparel and luxury goods (4.9 percent). And while it helps to have been born into a wealthy family, the report said the proportion that fully inherited their wealth dropped below 20 percent, with nearly half having founded or co-founded a business themselves. The good news: most billionaires do not reach the $1 billion threshold until their late 40s, with 93 percent of the world’s billionaires older than 45 years. By 2020, Wealth-X expects the global billionaire population to have exceeded 3,800, with more Asian technology entrepreneurs set to join them. The unusual business structure of the year’s biggest IPO – and why it might not be legal.